Fort Pulaski National Monument is located on Cockspur Island between Savannah and Tybee Island, Georgia. Situated at the mouth of the Savannah River, it was built to protect the city of Savannah, as part of a system of forts to protect the United States after the War of 1812. Today it stands as one of the best-preserved examples of these coastal defenses. Cockspur Island had been important since the founding of the Colony of Georgia due to its strategic location. 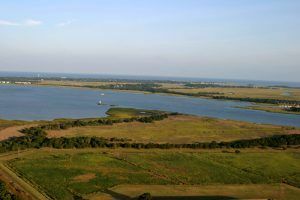 The first military use of Cockspur was in 1761 with the construction of an earth and log fort, named Fort George, near the confluence of the South Channel and Lazaretto Creek. Nearby, on Tybee Island, was the Lazaretto quarantine station and a customs checkpoint. The post protected both the entrances to the city as well as enforcing quarantine and customs regulations. During the American Revolution, the Patriots dismantled Fort George because of its exposed location. However, the British established a safe haven for Loyalists on Cockspur Island and since the Royal Governor, Sir James Wright, fled there with the great seal of the Province, Cockspur became for a short time capital of the colony of Georgia. Once the war ended, the new United States would build a fort on the site of Fort George in 1794-95. This new fort was constructed very much like the original, utilizing earth and logs, and was named for Revolutionary War hero, General Nathaniel Greene. The life of Fort Greene, however, would be short and tragic. In September 1804 a hurricane swept across the island washing away all vestiges of the fort. Following the War of 1812, President James Madison ordered a new system of coastal fortifications to protect the United States against foreign invasion. Construction of a new fort on Cockspur Island began in 1829 under the direction of Major General Babcock. Assigned to assist Major Babcock was a recent graduate of West Point, Second Lieutenant Robert E. Lee. The labor force consisted of both white and black men, some of whom were slaves and some of whom were free. They lived in a construction village on the northern bank of the Savannah River. A large pier was constructed to handle the arrival of supplies from ports north and south. The fort belonged to what is known as the Third System of coastal fortifications, which had greater structural durability than earlier forts. For strength, wooden pilings were sunk up to 70 feet into the mud to support an estimated 25,000,000 bricks. Further, the walls were 11 feet thick. At the time, it was thought to have been invincible to enemy attack, at which time Robert E. Lee said: “one might as well bombard the Rocky Mountains as Fort Pulaski”. In 1833, the facility was named Fort Pulaski in honor of Kazimierz Pulaski, a Polish soldier and military commander who fought in the American Revolution under the command of George Washington. The fort was finally completed in 1847 following 18 years of construction at a cost of nearly $1 million. However, at that time, the area was not threatened and it was under the control of only two caretakers until 1860. That changed in 1860 when South Carolina seceded from the United States and set in motion the Civil War, and Georgia governor Joseph E. Brown ordered Fort Pulaski to be taken by the state of Georgia. 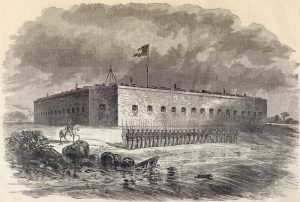 In February 1861, Georgia joined the Confederate States of America and Fort Pulaski was garrisoned by Confederate troops. By December 1861, nearby Tybee Island was thought to be too isolated and unprepared for conflict and was abandoned by Confederate forces. This allowed Union troops to gain a foothold across the Savannah River from Fort Pulaski. Union forces then began construction of batteries along the beaches of Tybee and began to arm the island. By February 1862, Tybee Island was fully armed and garrisoned and a Union gunboat patrolled the channel. 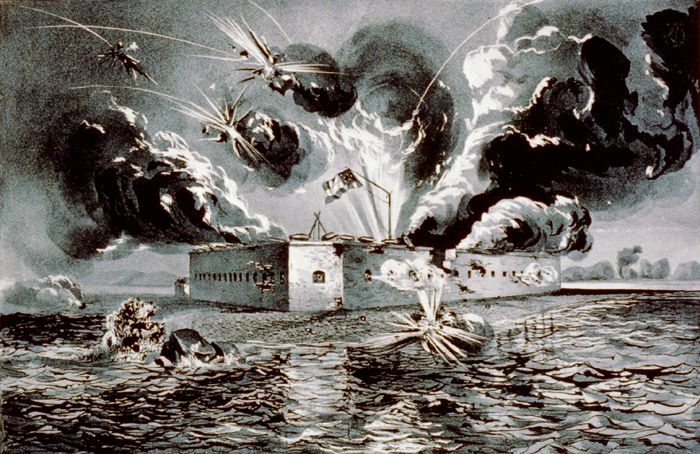 The Federals then destroyed the telegraph line between Savannah and Cockspur Island. Afterward, neither supplies nor reinforcements could be brought to Fort Pulaski and Confederate soldiers couldn’t escape to the mainland. After February 15 the only communication with Savannah was by a courier who came and went by night through the marshes, often having to swim the creeks and rivers to avoid the Federal pickets. On the morning of April 10, 1862, Union forces asked for the surrender of the Fort to prevent needless loss of life. Confederate Colonel Charles H. Olmstead, who believed the fort to be invincible, rejected the offer. 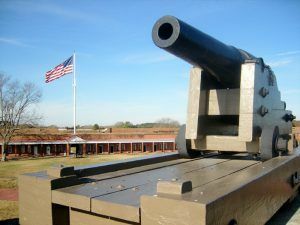 Though Fort Pulaski was prepared for an attack, they had no way of knowing that the Union Army had successfully tested a rifled cannon in combat, the success of which rendered brick fortifications obsolete. Under the command of Quincy A. Gillmore, Fort Pulaski was attacked with 36 guns, including the new James Rifled Cannon and Parrott rifles. The rifled projectiles, which could accurately be fired up to 4-5 miles, breached one of the fort’s corner walls that was dangerously close to the main powder magazine. Realizing that if the magazine exploded the fort would be seriously damaged and the garrison would suffer severe casualties, Olmstead surrendered after 2:00 pm on April 11, 1862. Only two soldiers, one Confederate, and one Union were injured in the attack. Gillmore succeeded almost entirely because of the rifled cannon, which caused massive damage in the walls of the fort. The triumph won him a promotion from engineer captain to brigadier general. Within six weeks of the surrender, Union forces repaired the Fort and all shipping in and out of Savannah ceased. The loss of Savannah as a viable Confederate port crippled the Southern war effort. With the Fort securely in Union control, General David Hunter, commander of the Union garrison issued General Order Number Seven, which stated that all slaves in Florida, Georgia, and South Carolina were now free. 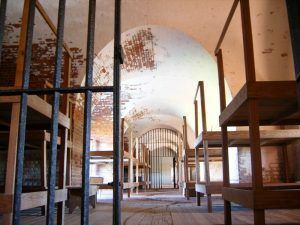 At this time, Fort Pulaski was made a final destination on the Underground Railroad as slaves throughout the area were freed upon arrival on Cockspur Island. Hundreds made their way to the island and took up residence in the fort’s old construction village. Many of the men would join together to form one of the first colored troops’ division and became members of the 1st and 3rd South Carolina Volunteers, which saw action late in the war. 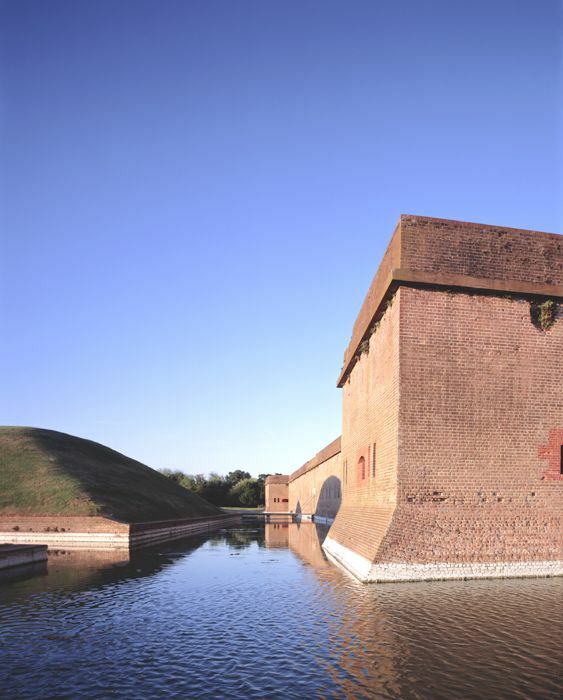 The garrison of Union soldiers reached 600 during the initial occupation of Fort Pulaski, but as the war dragged on it became obvious the Southern forces would not be able to retake the fort and the garrison was reduced to around 250 men. Late in the war, the fort would be made into a prison. When the war was over, Fort Pulaski continued as a military and political prison for a short while. It would house a Confederate Secretary of State, Secretary of the Treasury, Secretary of War, Assistant Secretary of War as well as three state governors, a senator and the man who had commanded the Fort after it had been taken by the South. 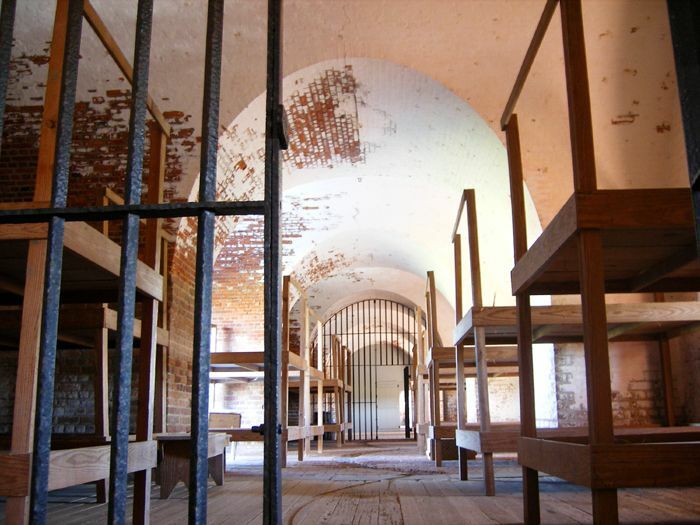 When its use as a prison was over, Fort Pulaski was unoccupied and neglected. 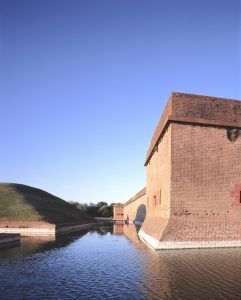 The War Department finally made Fort Pulaski a national monument in 1924 and in the 1930s, the Civilian Conservation Corps worked to rehabilitate the fort and the surrounding landscape. Cockspur Island saw further activity as a section base for the US Navy during World War II. Following the war, the island and historic fort again were under the watch of the National Park Service. The fort was listed on the National Register of Historic Places in 1966 and a museum opened in the 1980s. 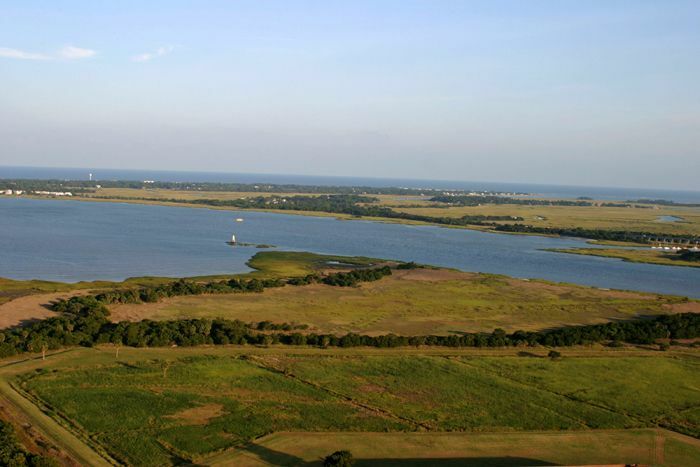 Today the island is beautifully maintained and open to visitors looking to explore pristine marshland, historic military engineering, and a diverse collection of native flora and fauna. Compiled and edited by Kathy Weiser-Alexander, January 2019.